Though not very large, this savory, slightly spicy, cheesecake will feed a crowd! Serve on your favorite crackers or pita wedges. Change the heat level of this appetizer by using fresh diced chile peppers in any amount. 1. Preheat oven to 325°F. Lightly spray 6-inch spring form pan with vegetable pan spray. Line the bottom of the pan with a piece of parchment paper, cut to fit. 2. For the crust, combine finely crushed corn chips and butter in small bowl, pressing into the bottom of the prepared pan. Bake 10 minutes. Cool and set aside. 3. To prepare the filling, beat cream cheese in medium bowl with electric mixer until smooth and creamy. Add eggs, one at a time; beating well. Stir in the cheese, chilies, garlic powder and chili powder, blending well. Pour over the prepared crust. Place pan on sheet pan and bake 40-45 minutes or until almost set in center. 4. Meanwhile, mix together the topping ingredients in small bowl. Remove pan from oven and gently spread topping over baked cheese spread. Bake an additional 10 minutes. Remove pan from oven and cool 1 hour. Cover and refrigerate at least 2 hours or until ready to serve. 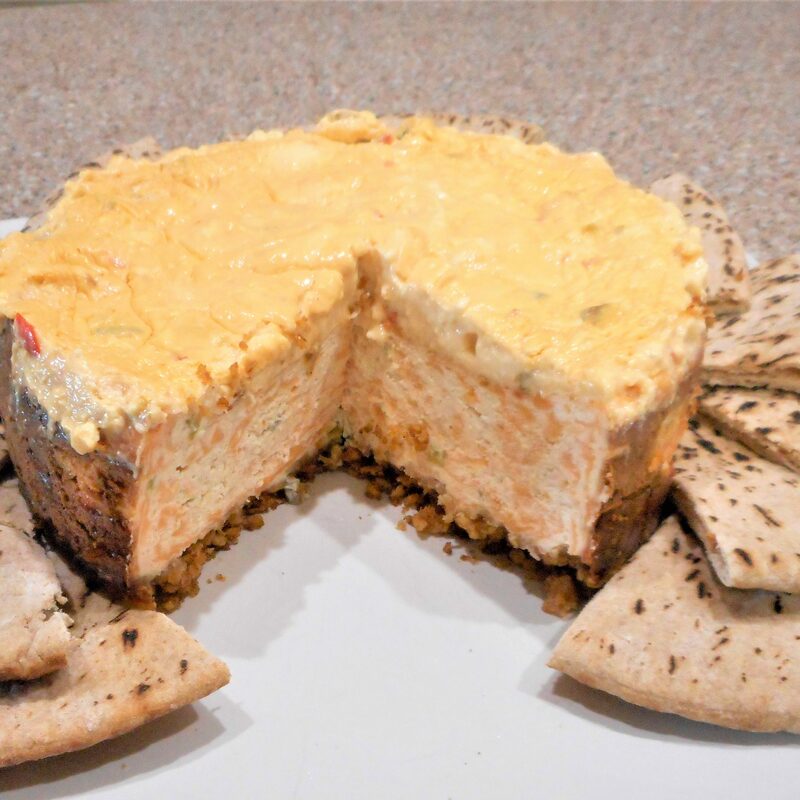 Place cheesecake on a serving plate and surround with pita wedges or crackers.